How can you learn about life? Listen to one! How much do you know about the people in your family or community? Take the time to find out more. You may be surprised by what you discover. A life interview is a chance to travel through time. In the present moment, the best gift you can give someone is to listen to them. You'll find out about the past as you hear about real-life experiences. And along the way, you may discover some timeless insights to help guide you through your own future. A life interview is a way to connect individuals and generations. It allows the person doing the interview to learn and understand more about another person, to gain insights into what living a life is all about and in turn the goals they have for their own life, and even to learn something about local events and history. An adult can do a life interview with another adult or elder, or a child or teenager can interview an adult – a parent, grandparent, great-grandparent or other family member, or a member of the local community. For the person being interviewed, it's an opportunity to share a part of themselves and feel like their life experiences have validity. People often want to talk about their lives, but they're rarely asked. When someone takes the time to listen, the message is that who the person is, what they've done, and the things they care about are important. When you're doing a life interview, it's helpful to have prepared questions. You can download a set of sample life interview questions. The Legacy Project's life interview tips are also helpful. A life interview can be a long-term family project you do in bits and pieces in person, via the phone, or through e-mail. It can be something you do during the holidays or summer when everyone is together, perhaps with an audio or video recording. It can also be a valuable and interesting part of a school assignment or event (e.g. a Grandparents Day or Intergenerational Day event). Students can enter the Legacy Project's annual Listen to a Life Contest. If you're writing your own life story, you can use the life interview questions as ideas and memory prompts. 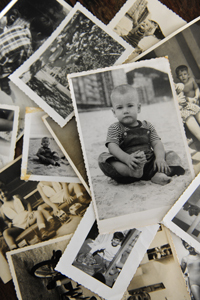 A life story becomes a valuable personal record and family keepsake.